On Wednesday, A Tribe Called Quest joined Kanye West on his “Yeezus” tour in Brooklyn at the Barclay’s Center. Fans in attendance were treated to a special performance as Busta Rhymes surprised fans and came out during Tribe’s live rendition of their classic song “Scenario.” Unfortunately, Busta’s microphone fell victim to some unforeseen technical difficulties. Check out how it all went down as Kanye’s tour picks back up and hits the road. 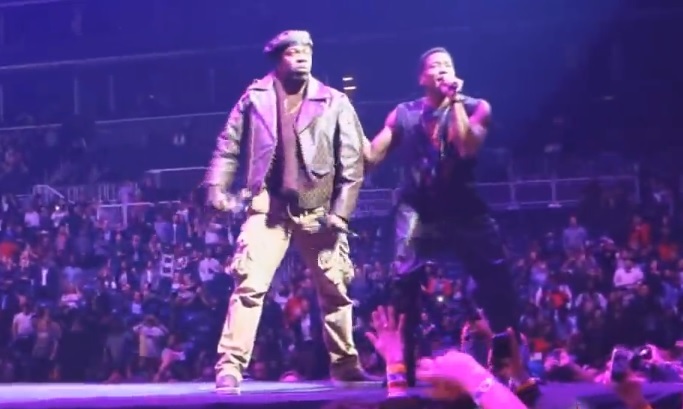 This entry was posted in Live Performance, Video and tagged A tribe called quest, barclay's, busta rhymes, hip hop, new york, rap, scenario, Yeezus. Bookmark the permalink.